Nice orange suit there, Mr. Damon. 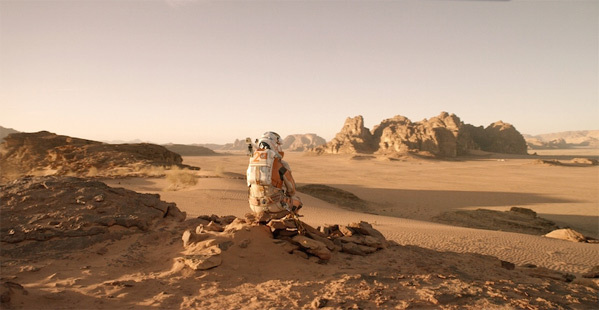 Coming to theaters later this year is Ridley Scott's next sci-fi movie, The Martian, adapted from Andy Weir's novel about an astronaut stranded on Mars. Matt Damon plays Mark Watney, that astronaut on Mars, and while we posted a "first look" a few months ago, this is really the photo everyone's been waiting to see. Well, everyone should wait to see the trailer for this - because the footage is going to be the most impressive part. Then again, if you're a space suit nerd this may be your moment to flip out. The shot (which looks like a magazine scan) shows Damon in his astronaut suit for his mission to Mars, on the ARES III. It's a cool shot, with some of the Martian landscape reflecting in his visor. Check it out. You can see another shot of Matt Damon on the set here, revealed a few months ago. Stay tuned for more. 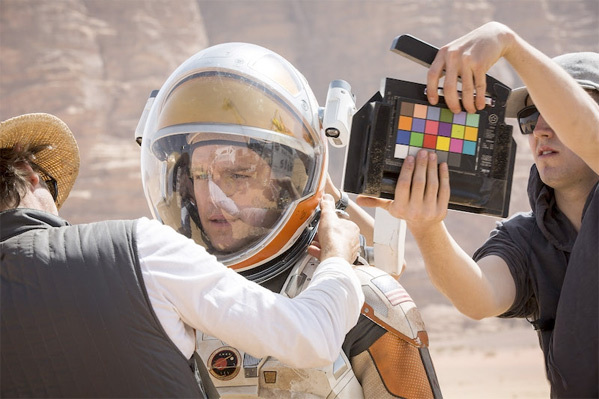 The Martian is directed by Ridley Scott (Alien, Gladiator, Prometheus) and written by Drew Goddard (Cabin in the Woods). 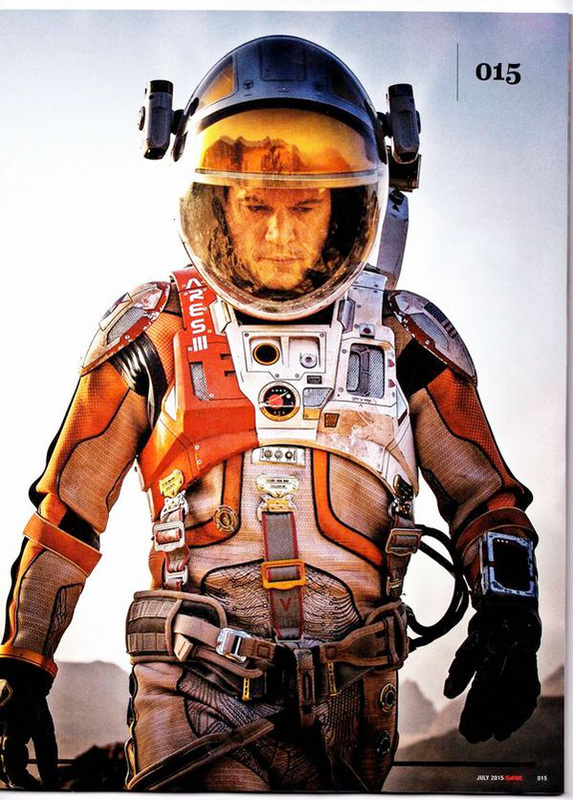 Six days ago, astronaut Mark Watney (Matt Damon) became one of the first people to walk on Mars. But after a dust storm nearly kills him and forces his crew to evacuate while thinking him dead, Mark finds himself stranded and completely alone with no way to even signal Earth that he’s alive—and even if he could get word out, his supplies would be gone long before a rescue could arrive. But Mark isn’t ready to give up yet. Jessica Chastain, Kristen Wiig, Chiwetel Ejiofor, Donald Glover, Sebastian Stan and more star in the film 20th Century Fox will release in time for Thanksgiving on November 25th. Try the audiobook, Bo. The reader does an amazing job at bringing the characters to life. I think people who love technical information and fairly flat writing love THE MARTIAN. As soon as I heard Adam Savage, of MYTHBUSTERS was a fan, I bought and read it and listened to it. Am I the only person that thinks his suit looks rediculous and unbelievable? Maybe just the scan and all the saturation, looks like a lot going on, we'll see more soon I hope. I wouldn't use either of those words, but I'm sort of with you on this. I'd say it looks much more cluttered and busy than I would've liked. Not to make comparisons so early on, but I thought the space suits in Interstellar were almost perfectly balanced between looking realistically functional *and* aesthetically pleasing. Perfection. That is pretty much exactly how I imagined Watney to look whilst reading the novel. Looks like the same traitor to me. Traitor to what? You bellend. Cool suit, I like that big helmet. It looks to have a nice field of vision. This sounds like "Gravity" on Mars! Sounds like Cast Away on Mars! Having read the book is say this is closer to the plot. The book was actually pretty good. Hopefully they dtay faithful to the mood of it. Sounds like the classic Robinson Crusoe on Mars. How stupid post! try not to be marked as a troll. what political beliefs do you disagree with? Right wing trolls are the best kind of trolls. Keep on trollin' on! Considering the book upon which it is based was written well prior to the crap that was Interstellar, your post is inane and moot. The political comment only cements you as an utter berk. Christ HOW much longer do we have to wait for a trailer??? I`m so intrigued ugh. A first look reveal in a magazine is usually a sign the trailer is a few weeks away. 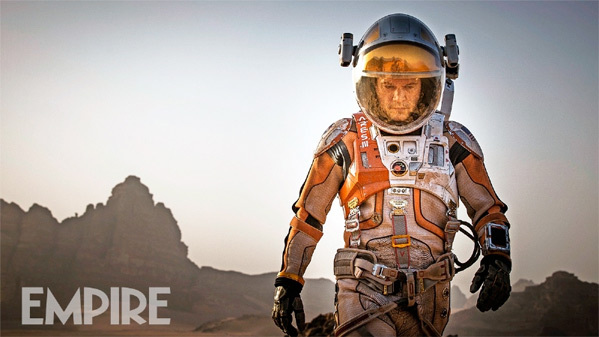 So Gravity with Matt Damon.......but on Mars.......yuck. I am just defending the source material here, but it is a much more substantial plot than GRAVITY. Matt Damon is so Overrated! The book was brilliant!!! would of preferred someone other then matt damon but is sure he'll do a good enough job . Let me guess, he's lying. After reading the book I thought it would make a great movie, I hope they don't change the plot too much otherwise it will lose some of its appeal. Also, I am not sure about the choice of lead actor, I can't picture Matt Damon doing some of the funny parts. Same here... I really hope that they don't cut out the humor. Otherwise it would be really dry.